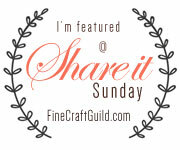 There had been a gap in my posts before my Pirate Party post. Our oldest had a three week vacation. We had such a fun and relaxed time. During his vacation I have been busy with multiple projects simultaneously. But I just couldn’t get around to finishing one and blog about it. I didn’t realise how much time had passed bij until the next Project Run and Play challenge was announced. 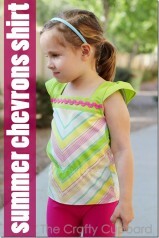 This months challenge is the Summer Chevron Shirt by Melanie over at The Crafty Cupboard. I really like the chevron shirt pattern and the square neckline of the pattern. 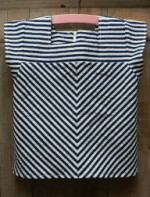 Unfortunately I didn’t have chevron fabric but with summer coming I wanted to use a blue and white striped seersucker I had in my stash. 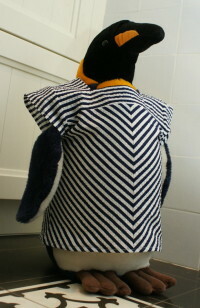 I modified the pattern by cutting the front and back on the bias. I didn’t cut it on fold but cut both the front and back in two separate pieces. This way I could create a chevron style fabric AND add a zipper to the back. At first I wanted to add a box pleat in the front panel so I added some extra width to the pattern pieces. But when I pinned it in place it just didn’t work with the striped fabric so I left it out and tightened the pattern pieces to the original size. 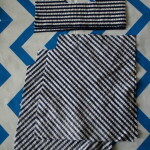 I tried the sleeves on both ways and but favoured the original way of the chevron shirt pattern. 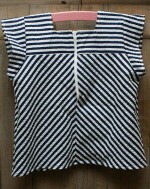 So besides the zipper in the back no major adaptations to the original Summer Chevron Shirt pattern. After I pinned on the sleeves I wanted to try it on our little girl for fit. I pinned the side and wanted to fit it. NO WAY she was gonna let me come close! She simply refused to let me come near and started running around the room giggling. Because of the pins I couldn’t fit it if she wouldn’t cooperate. So I went to my sewing machine and kept my fingers crossed. Unfortunately ( or actually fortunately) our little girl is sound asleep right now. If I compare the shirt to other shirts her size it should fit, but I won’t know for sure until tomorrow morning. Luckily I had a willing sub who would take her place for a shoot. 😉 I will upload some extra pictures of my version of the Summer Chevron Shirt later on. That looks so professional–nice stripe matching! Looks great with the stripes running in different directions. I love seersucker.